← Don’t Let the FCC Impose Dial-Up Access Charges! I spent much of the weekend booting up both old favorites and games I’d never tried before. It was a lot of fun. And while I was at it, I took a few very rough videos that I’ve stitched together into what you see below. It’s crude, but I’ll bet there are a few games in there you’ve not seen before. And the games shown? In order: Flight Simulator II, Sierra Christmas Demo, The Black Cauldron, Super Pitfall, NitrOS-9, Donkey Kong, Silpheed, Pitfall II, Tut, Mega-Bug, Horace Goes Skiing, Pooyan, Time Bandit, Rubes Cubes, and Glove. 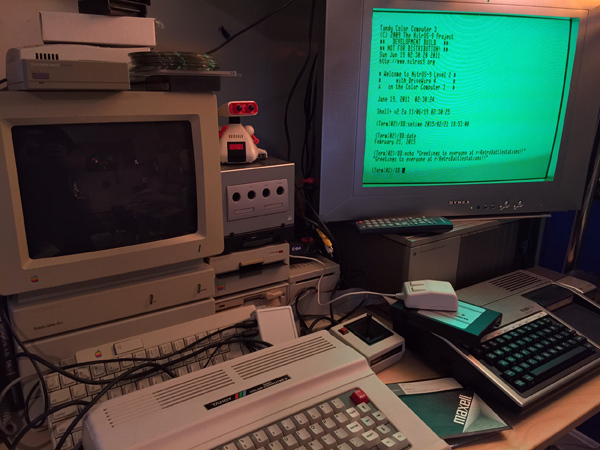 This entry was posted in r/Retrobattlestations, Tandy / TRS-80. Bookmark the permalink. Some of the artifact colors were reversed (Time Bandit, for example)… you should hold and hit reset to switch the composite artifact colors to get the proper colors. It also appears that you have double speed enabled at all times; on the Coco 1/2 games, they were running twice as fast as they originally did (mind you, in some cases, that makes the game better; in others, they become too fast to play easily).